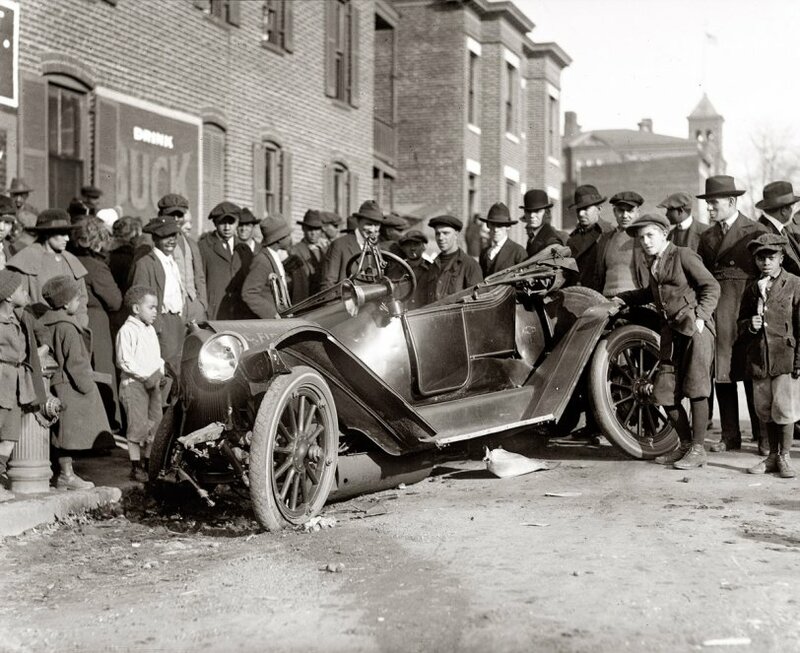 Wreck of District of Columbia fire chief's car. January 5, 1921. View larger. National Photo Company. What did the buggy hit? Submitted by FireDoug on Thu, 06/21/2012 - 11:01am. From the article, probably the fire engine that Sgt. Costello and Private Jones were riding on. See the fire engine on the right near the alley on Columbia Rd. for another photo of the incident. Submitted by Anonymous Tipster on Tue, 05/01/2007 - 8:14pm. it is odd, what did the chief crash into? Submitted by Jen on Sun, 04/29/2007 - 7:44pm. Dave, Do you know if they hit another car, or something else? Submitted by Dave on Tue, 04/17/2007 - 5:34pm. Battalion Fire Chief Timothy J. Donohue continued to improve yesterday from injuries received in a motor collision Wednesday afternoon at Columbia road and Sherman avenue. With a cracked jaw, several ribs broken and his face, head and body lacerated, Donohue, despite his 63 years, rallied in a manner which pleased the staff at Garfield Hospital. B.F. Foley, driver for Donohue, is still suffering from lacerations and shock, but is not in danger. Sergt. Costello and Private Jones have gone to their homes. Submitted by Anonymous Tipster on Tue, 04/17/2007 - 1:01pm. You think the chief's car was banged up? Submitted by Anonymous Tipster on Mon, 04/16/2007 - 11:30pm.